"I had to let you know that as I was coming home from work tonight I passed the British Heart Foundation Charity Shop. 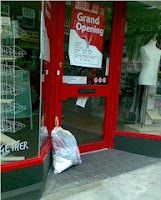 The place hasn’t finished being refurbished yet, let alone been opened but someone had left a carrier bag of clothes outside it. This place makes me laugh. Carry on Worcester Park!!!!!!"